While perusing the paper this past week, I came across an article describing the new trends in home building. Although it was originally published in another city, the new design and amenities buyers want in custom homes can be found in many neighborhoods in Indianapolis. What are the hot ticket items buyers are looking for? No longer just a master bedroom, and no longer relegated to the upstairs, Master Suites provide a sanctuary of privacy within the home. 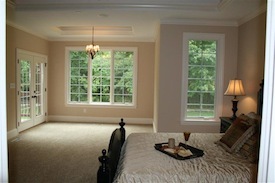 The preferred location is on the main level.Today’s master suite is larger, with a sitting area or sitting room. It’s not just about the bedroom either, master bathrooms are much like those found in the finest resorts. Lots of tile, spa bathtubs, large showers with dual heads, at least one, usually two walk-in closets and granite or quartz countertops make up the designer masterbath. I remember my grandparents having what they called a mud room. I always thought of it as the laundry room. Mud rooms can be separate or inclusive of the laundry room. Either way, the laundry room is larger and not just a closet. Mostly found in the entrance from the garage or another exterior entrance, mud rooms allow extra space for backbacks, shoes, coats; anything you want to drop once you get inside the door. Media Rooms Media Rooms in Indianapolis are usually found in the basement area. I have seen them both as a separate room or as a large open area, but always with a large screen TV and comfy seating. Many offer a bar area in the basement as well, ranging in size from small to kitchen size, with space for a refridgerator, microwave and sink. So, whether you are an entertainer or just want someplace to keep snacks close-by, you’ll have the space. Often, I hear the media room called, “The Man Room”. E-Space I have only seen this in a few homes, but it was definately e-space. 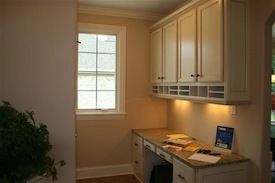 Located between the mud room and the kitchen, it consists of a desk space, ideally used as a place for charging or recharging cell phones, laptops, ipods or any of our daily “keep me connected” tools. If not e-space, most homebuyers want a separate office which serves the same purpose. Again, main floor level is preferred. Family Room, Hearth Room, Morning Room Whatever you want to call it, a less formal space within the home designed for relaxation. I like the morning room version with lots of windows to let the light in. Bigger Rooms Not only do homebuyers want specific rooms, all the rooms must be bigger. Although not mentioned in the article, another desired feature are Jack and Jill bathrooms and/or more bathrooms. So, where do you find homes in the Indianapolis area which fit the bill for today’s homebuyer? There are many areas around the city where you can find homes with all or some of these amenities and you don’t have to build custom to find them. I have toured and/or shown several in the last year. And where I go, so goes my camera. 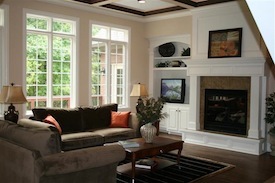 The pictures here are from homes in Carmel Indiana.